On a bustling Saturday in Harlem, New York, curious passers-by stopped to acknowledge the crowd gathering outside of the neighborhood’s famed Red Rooster Harlem restaurant. 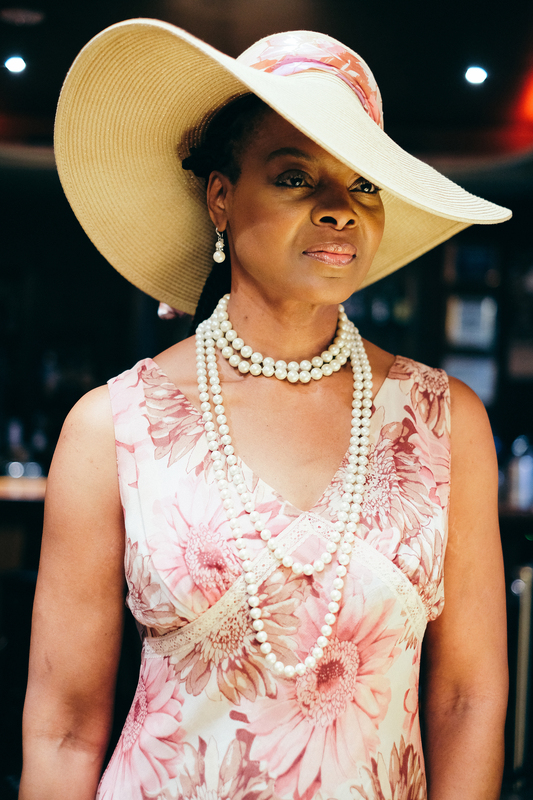 A portion of the sidewalk on Lenox Avenue had become a personal catwalk for patrons attending the Harlem Derby’s 5th Annual Kentucky Derby Gala, Run for the Roses. 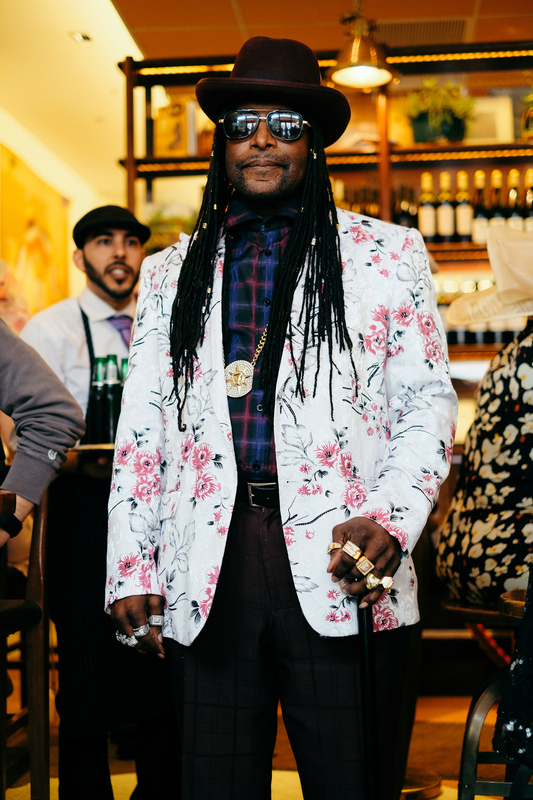 The fashion scene, which flowed from inside the restaurant and onto the streets, was reminiscent of one that could be found at nearly every black church across America on Easter Sunday. Men sported snazzy fedoras and straw hats with tailored suits as women showed off every hat from handcrafted fascinators to wide-brimmed cloches, paired with custom Sunday-best threads on a breezy afternoon. The gathering almost felt spiritual. Renowned chef Marcus Samuelsson, Red Rooster Harlem’s owner, took in the sights around him and smiled. Outside of the restaurant’s door was a short red carpet that offered the celebrity experience and a photo op. In the corner of the restaurant’s patio, bottles of Maker’s Mark bourbon whiskey lined a table where bartenders quickly churned out mint juleps, the popular Derby Day drink. Inside, a live band played near the entrance of the restaurant right next to a large-screen television, where patrons would later gather to watch jockey John Velazquez and crowd favorite Always Dreaming win the 143rd running of the Kentucky Derby at Churchill Downs. It’s a sight that Harlem Derby co-founder Rob Owens looks forward to every year. Owens, a native Kentuckian who has lived in Harlem for the past 30 years, wanted to bring the familiar culture of the Kentucky Derby to his neighborhood while also paying homage to the oft-forgotten black jockeys and trainers who dominated professional horse racing as early as 1875. Last year, Owens launched his own line of hats named after famous black jockeys. 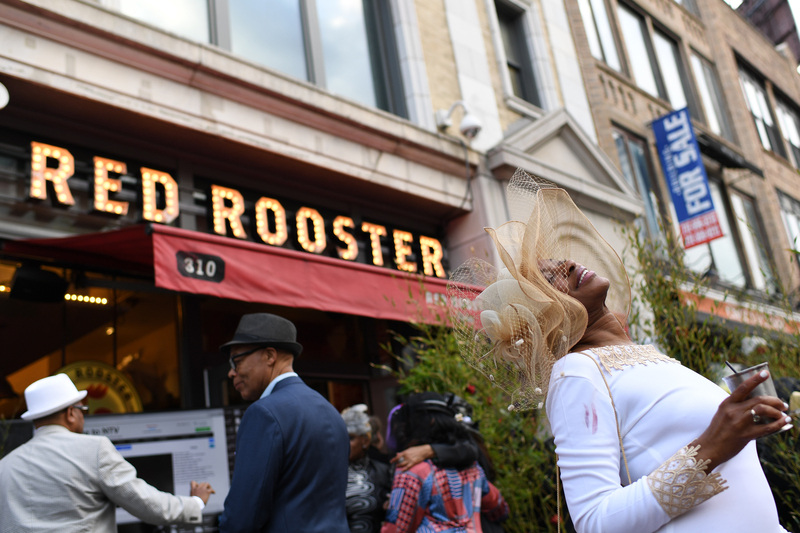 Guests celebrate after the running of the Kentucky Derby on the patio of Red Rooster Harlem on May 6, 2017 in Harlem, New York. Earlier in the day, The Undefeated hosted a panel to discuss the pertinent history of black jockeys and trainers, as well as the state of horse racing for black people today. The panel, hosted by The Undefeated’s writer-at-large William Rhoden, included Tony Wilson, a horse trainer from Camden, New Jersey, who has won more than 100 races and 10 stakes races; Katherine Mooney, an assistant professor of history at Florida State University; and Rhiannon Walker, an associate editor for The Undefeated. All three panelists spoke at length about the history of horse racing, its young, talented black heroes, their disappearance from the sport and whether horse racing will ever see black dominance again. At the first Kentucky Derby at Churchill Downs in 1875, 13 of the 15 jockeys competing were black. Fifteen of the first 28 winners were African-American men, according to a video researched and voiced by Walker about the history of black jockeys. For now, Owens hopes to continue spreading the word and hidden history through his efforts in Harlem.